Delicate, ethereal, gentle…lemmings? Spirits is a gorgeous take on the classic Lemmings series, adding its own particular spin thanks to luminous graphics and innovative wind physics. 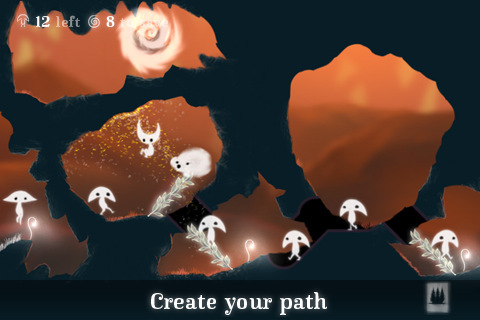 In terms of general gameplay, Spirits should feel quite familiar to fans of Lemmings. You start off with a finite number of the mystical, mushroom-shaped Spirits, and your goal is to get as many of them as possible through a twisted landscape to a swirling vortex. The primary differences come in terms of the swirling, interactive eddies of wind and the beautifully intuitive interface that allows you to transform any Spirit into a tool to help guide the rest of the Spirits to the goal. The Spirits will always blindly move forward, so you have to work fast and think smart if you’re going to keep them from all plunging to a mindless doom. In addition to being a gorgeous display of physics, the wind is a key feature of play. Spirits can float on the currents, but the environment is also littered with deadly spike traps, so you must be careful how you direct the little guys. Aside from the wind, which can either help or hinder, various crags and drops make forging a straight path difficult. To get around this, you can transform Spirits into useful plant-like walkways, use them to dig through obstacles, and utilize other special abilities to get them across the dreamy and dangerous world. Unlike Lemmings, each Spirit can perform any job. All it takes is a couple of taps and you’ve transmogrified a Spirit into a handy wind generator or digging machine, but each transformation is permanent and you only have a limited number of Spirits, so strategy counts. Of course, the restart button is always there, and you’ll almost certainly make use of it as you work your way through the game. With dozens of levels to keep your brain engaged, there’s plenty of casual gaming fun to be had, but getting the Spirits to the vortex is only half of the battle. 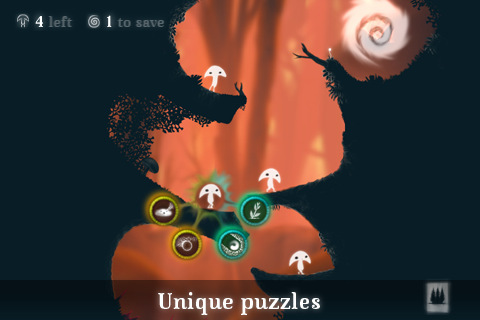 You can add in an additional layer of challenge by trying to collect glowing plants along the way, and finishing each level with a perfect score, meaning with the maximum number of Spirits and all plants collected, is no small feat. In addition to the engrossing gameplay, the graphics and the sound for the game are delightful. Looking a bit like the love children of Hayao Miyazaki and Tim Burton, the Spirits are charmingly weird creatures, and the soundtrack is a pleasantly moody orchestral confection that fits the scene beautifully. Overall, I found this to be a wonderfully relaxing and satisfying experience. Although it’s obvious Spirits isn’t based on an original concept, the execution is flawless, and there’s enough innovation to make it feel like a legitimate game in its own right, and not just a cheap copy. Definitely a worthwhile buy. AppSafari review of Spirits was written by Tracy Yonemoto on December 24th, 2010 and categorized under App Store, Featured, Fun, Games, iPad apps, Physics Based, Puzzler, Strategy. Page viewed 3417 times, 1 so far today. Need help on using these apps? Please read the Help Page.